Historically Latin America was the part of the “new world” that Christopher Columbus “discovered” in 1492, which soon was brutally conquered by the Spanish and Portuguese. Obviously it was only a “discovery” from a Eurocentric perspective because, in fact, on these vast lands there were hundreds of advanced native cultures living for centuries. However after countless years of violent colonization and internal wars, the independence emerged on the whole continent launching a group of new countries with their own and unique identities. But what is Latin America nowadays? A complex answer for a complex puzzle: some people would say it’s a huge cocktail that combines -in a more or less chaotic way- the rests (or ruins) of Pre-Columbus Cultures and diverse European traditions mixed with a high dose of pseudo-tropical weathers, Latin manners and unstable economies... although that’s also a simplification: Latin America is just Latin America and it deserves to be “rediscovered”... But let’s go straight to the record. 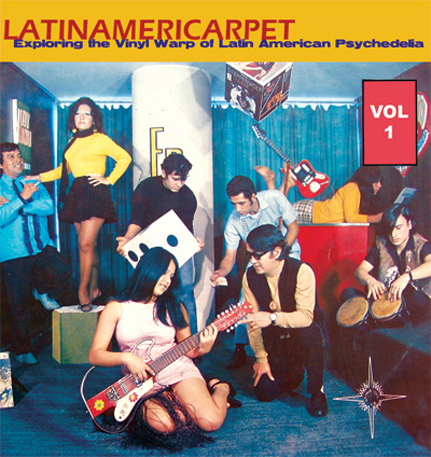 Latinamericarpet is a non-stop collage of vinyl artifacts culled from stacks of forgotten LPs of the 1960’s and 1970’s from Argentina, Brazil, Mexico, Peru, Chile, and Isle de Pascua (Easter Island). This compilation brings together some glittering sounds from LPs that have been somehow forgotten over the years. Although most of the tracks presented here were recorded during the peak of the psychedelic era in the late 60’s and early 70’s, this is not a collection packed with guitar group psychedelia although there are a few unknown gems here that qualify as such. There are also pop and folkloric songs, children’s songs, odd instructional record excerpts, and a few other anomalies from our neighbours to the south. For sure these selections are only brief samples of what was done in Latin America in those glorious years, but while we wait for further works that can bring to light more sounds from this “undiscovered” continent, just relax, turn on your stereo and keep this magic Latinamericarpet flying. Compilation/Liner notes by Albano Costillares in Argentina.